He’ll hold your hand for a short time, but he’ll be held in your heart forever. 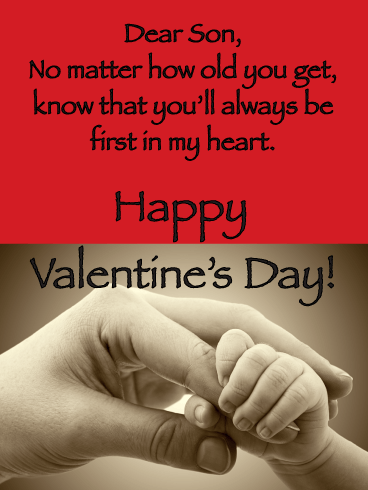 Let your son know how much he means to you with this touching Valentine’s card. No matter how old he is, he’ll appreciate your words, which will remind him of the special bond you’ll always share. Dear Son, No matter how old you get, know that you’ll always be first in my heart. Happy Valentine’s Day! 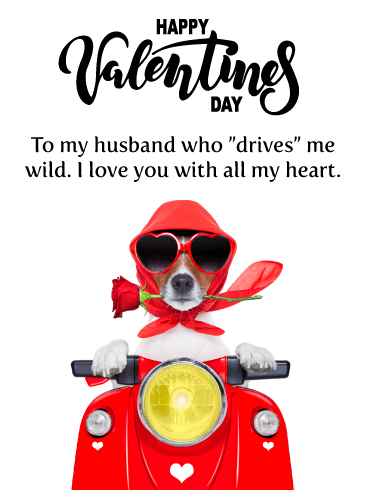 Get your husband’s motor running with this cute and funny Valentine’s Day card! It features a puppy wearing heart sunglasses as she holds a rose in her mouth. So cute! Your husband is going to get a laugh out of this one, especially when he reads that he drives you wild. Send this romantic and funny Valentine’s Day card over to your husband soon so he can start his day with a smile. 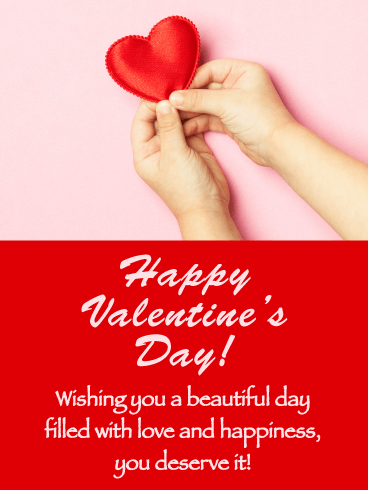 This classic Valentine's greeting card can be sent to any special person in your life-family members, good friends, even your one true love. Whimsical hearts are joined by twinkling lights, creating a charming glow in the background that complements the sweet greeting-a reminder to keep those you care about close to your heart on February 14th. For the sweetest person you know we present to you the Sweets for the Sweet Happy Valentine’s Day Card! 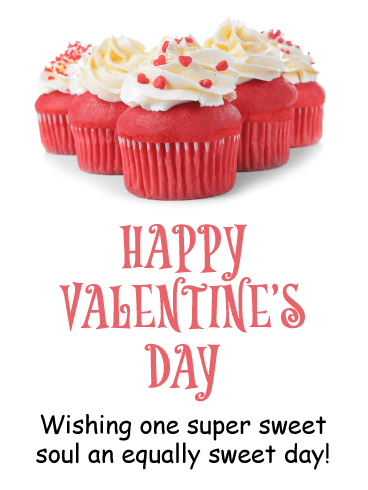 With big, tempting, pink velvet cupcakes stacked high with buttercream frosting and a light sprinkling of candy hearts, this card will make anyone drool! The playful fonts seal the deal by wishing that sweet soul an equally sweet day! Almost too much sugar to handle—almost! Those three most important “L” words; live, laugh, love, they never get old, am I right? 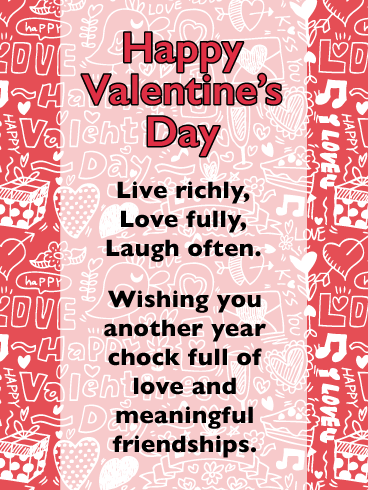 That’s the theme of the Live, Love, Laugh Happy Valentine’s Day Card. Send it to your friend, your mom, your brother, your coworker, your son, your neighbor, etc, it works for everyone! Wish that fantastic person another year of meaningful friendships and abundant love! This one is for dog lovers with a great sense of humor only! Just kidding, this silly, sweet card is perfect for everyone you’re nuts about this Valentine’s Day. 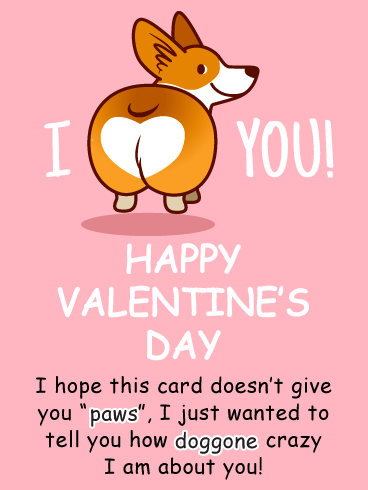 Send the Corgi Love Funny Valentine’s Day Card to put a smile on all your favorite faces! It features, not one, but two hilarious dog puns, guaranteed to give the receiver the giggles! This extremely cute card is just begging to be sent to the peanut butter to your jelly, the mac to your cheese, that’s right, your best friend! 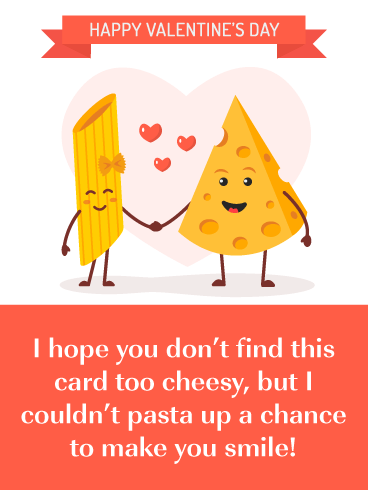 Send the Cheesy Jokes Card to crack someone up this Valentine’s Day. The card isn’t too sentimental though, so it is suitable to use for everyone on your list of people to wish a Happy Valentine’s Day to! This Valentine’s Day card has a funky, retro design, but its message couldn’t be more current or thoughtful! 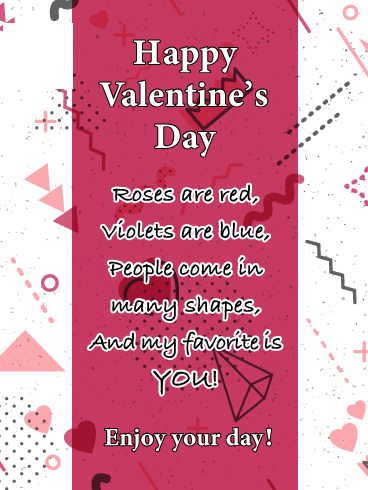 The words are a sweet-as-candy twist on the classic “roses are red” poem, ending with telling the recipient they’re your favorite shape! 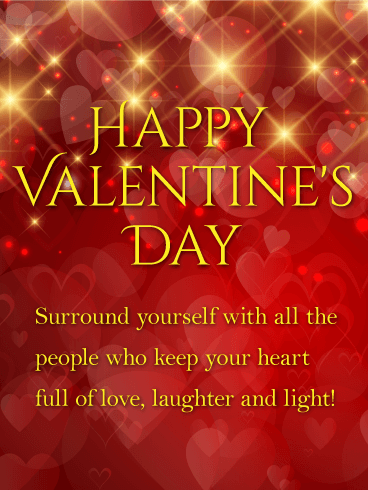 Send the My Favorite Shape is You Happy Valentine’s Day Card to totally make someone’s day this year! Greetings! How adorable is this little robot with his digital heart eyes? 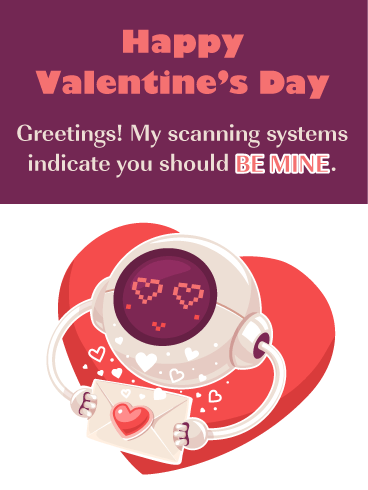 Send the Be Mine Bot Happy Valentine’s Card to make someone say “awwww” this Valentine’s Day! This card is great for anyone and everyone who enjoys fun cards! Our scanning systems indicate whomever receives this card will be well pleased and probably give you a big ol’ hug if they can! While April showers bring May flowers, this February you yourself will be the one bringing the showers. In the form of love. 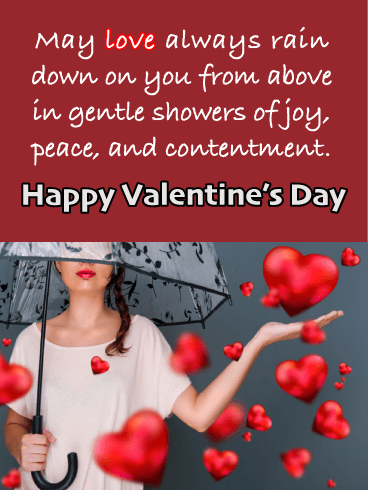 Send the Showers of Love Happy Valentine’s Day Card to someone truly special and make their day! Wish them joy, peace, and contentment with the help of this sweet photo card of a young woman with an umbrella. Are you in need of a classic card for someone special? The Simply Beautiful Happy Valentine’s Day Card is in gentle pinks and cheerful reds. Adorned with a simple image of a child’s hands holding a heart. It’s tasteful in its simplicity. Then it goes on to wish the recipient a beautiful day of love and happiness because they deserve it! This gorgeous cake card has a slice missing! But that’s okay, cause the message is still wishing the recipient a slice of the good life! We’d like to imagine life probably tastes like this moist yellow cake, with multiple layers, and beautifully-piped pink frosting. Best served with a hot cup of coffee! 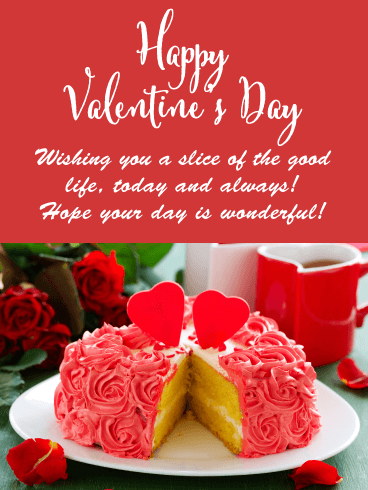 Send the Slice of the Good Life Happy Valentine’s Day Card to someone terrific and make their day even brighter! If you stop and think about what a good day for a dog would consist of, it all sounds like some pretty good stuff! 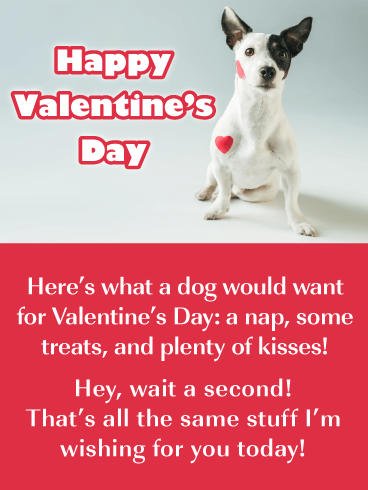 Send the Doggone Good Time funny Valentine’s Day Card to spread some smiles! A dog would want naps, treats, and kisses, and come to think of it, a human would enjoy all those things for Valentine’s Day too! !